Comments: Mahi Beamer, a tenor, specializes in the difficult high-register falsetto: a tradition in Hawaiian music from the time when women were forbidden by kapu to sing. 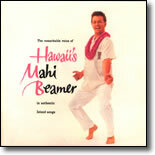 Many of these songs were composed by members of Mahi's own family, the Desha-Beamer `ohana, famous for generations as outstanding hawaiian musician. This CD is a re-release of a previously "out of print" classic album from 1958.